Are you trying to save on buying new furniture for your home? One of the best ways to do that is to build your own DIY couch. A DIY couch may seem like a complicated project that only seasoned wood crafting masters can do. It can’t be further from the truth and we will prove that in this post. All you need to build a couch is to have the right plans and instructions. There are many ways to build a piece of furniture, using many different kinds of materials. You can make a complicated sectional sofa with built-in storage, and you can make a quick and easy pallet couch. It all depends on your needs and your level of expertise. However, you can be sure you can build it even if you’re a beginner. Here are 20 easy projects on a budget to get you on the right track. Let’s dig in! This is one of the best repurposing projects that we’ve ever seen. Building a couch isn’t easy and takes some effort. So anything you can do to simplify the task is most welcome. This project does that by making use of old doors! Old doors as material for repurposing is very convenient. Consider them as wood boards. Then, by putting them together, you can get even such a complicate handmade furniture like a couch. This is an enjoyable project if you can get yourself a few old doors (try Craigslist). Who says you can’t build a DIY couch over a weekend? 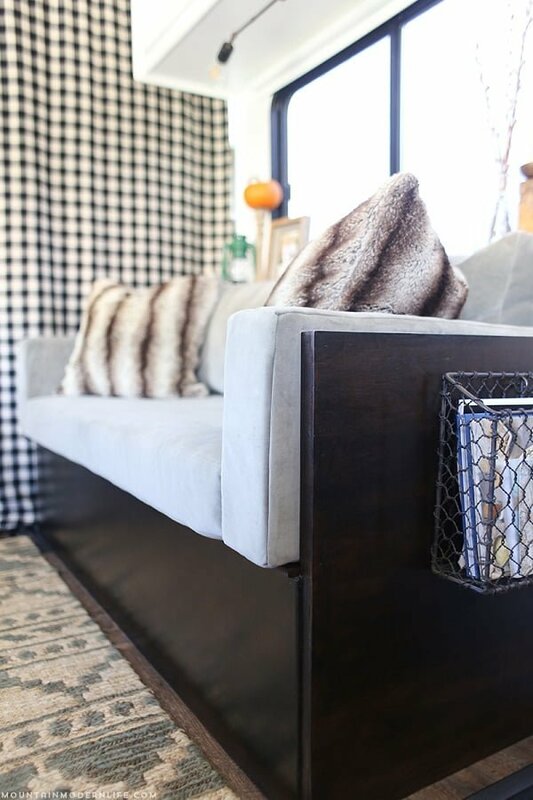 This project is made for a DIY sofa and a daybed for the patio, but it can be easily re-made for your DIY couch. After all, it’s pretty much the same piece of furniture with a different purpose. That means you can quickly build your couch from pallets as shown in this tutorial. Building a sofa from pallets involves a few fine details (as explained in the instructions) but it’s easily doable. You can complete this project even if you’re a beginner. Just have patience and enjoy your little project! 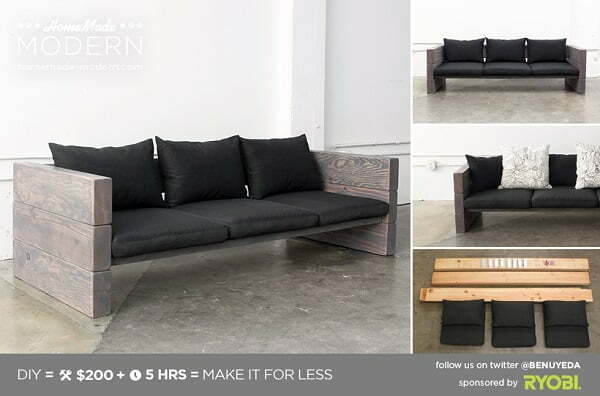 Want to make your DIY couch look like it was made by a master? You need a more complicated project but with step by step instructions. And this is that kind of a tutorial. Let’s make a couch from scratch from construction lumber! If you complete this project (by following the instructions), you’re guaranteed to get handmade furniture to be proud of. You won’t stop talking about it once it’s finished! The project costs about $250 and takes about 5 hours to complete (a little more if you’re a beginner). So it’s a great deal compared to buying an expensive couch. We’re just getting started! If you’re up for a challenge and want to build something more functional, then this project is definitely for you. Do you want something more than a regular couch? How about one that turns into a day bed? The tutorial includes plans and instructions on how to complete this little project. It might be a bit more complicated, but it’s all worth it. 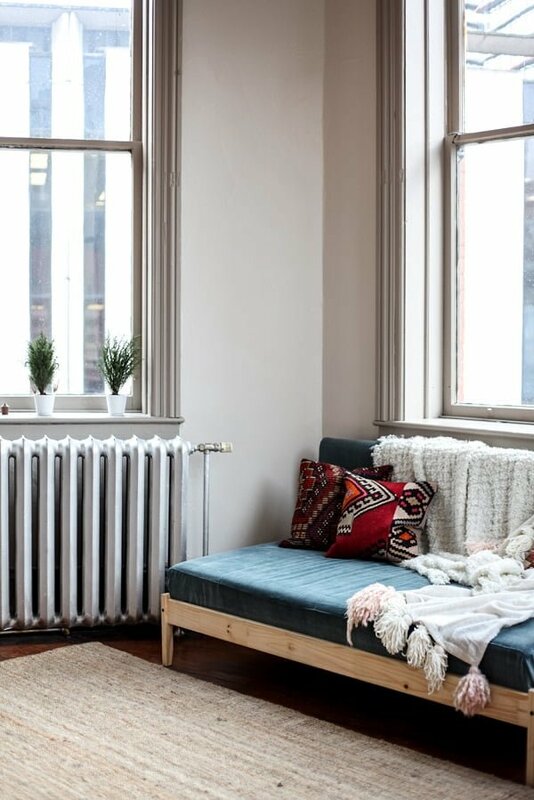 You’ll have to invest about $200 into your DIY couch, and it’s a great deal. It gets complicated fast, but this project is one for more advanced crafters. 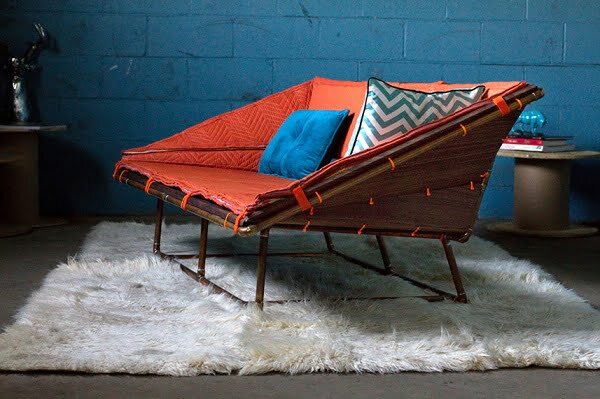 If you complete this project, you’ll have a DIY couch that looks like its designer made. And that’s something to be proud of. Don’t worry, all the details about this rather complicated project are included. You’ll be able to follow through and build the couch with some effort. The project might take more than a weekend if you’re a beginner but it’s very much fun! Rogue Engineer always has detail plans for furniture, and this is no different. 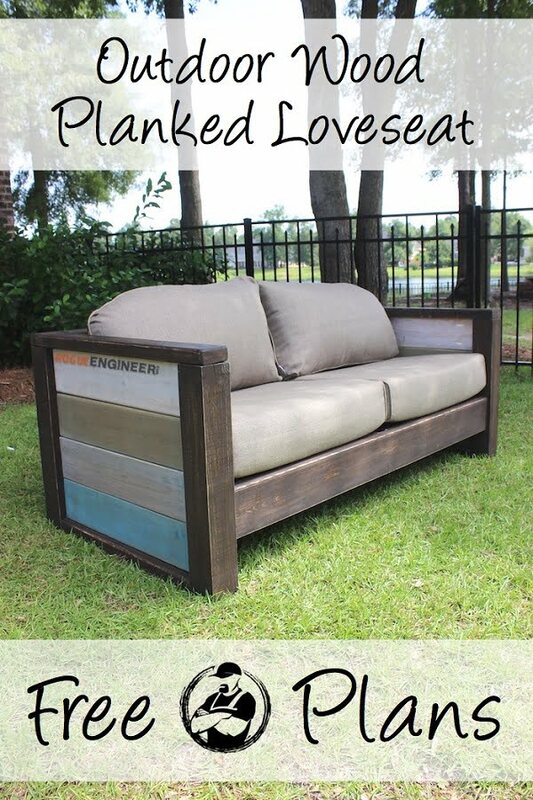 While this project is made for an outside love seat, you can easily use it to build a DIY couch for your home. There’s little difference between the two! You’ll get a complete list of tools and materials, as well as the plans for this piece of furniture. All you have to do is follow instructions to build it. It’s a great investment to save on buying a new couch. Have fun! 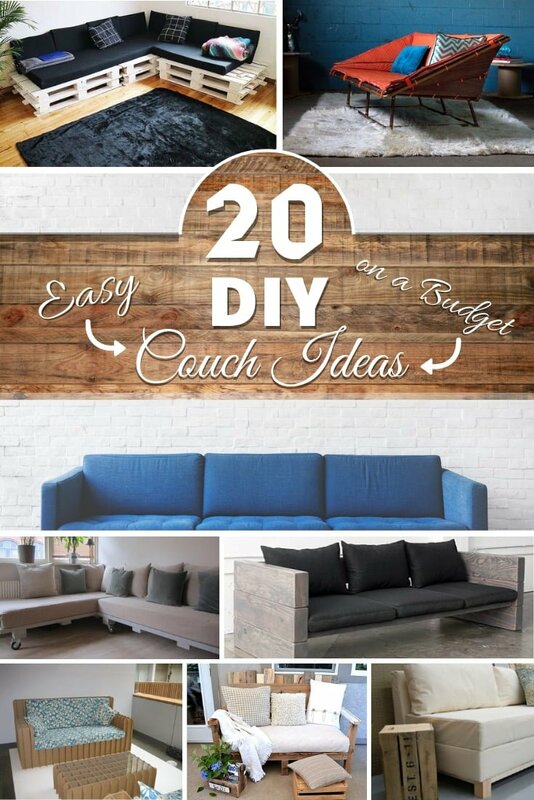 Can you make a DIY couch in as little steps as possible? It turns out you can. This project takes only ten steps to complete. And you can have not just a sofa but a bunk bed too! Talk about multi-functional DIY furniture! So for this project, you’ll need pallet wood. We assume you know where to get it. Then all you have to do is make the furniture! It might sound easier than it is, but it’s not a complicated project at all. Check out this great tutorial, and you will see. You can get amazing results by transforming furniture. 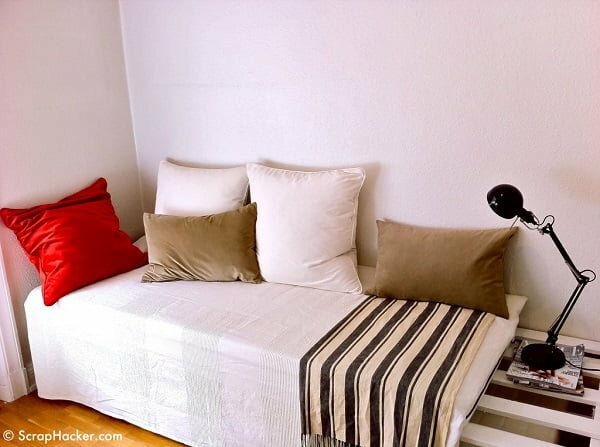 In this case, we’re making a DIY couch out of a cheap IKEA bed. It’s a good trade-off since the bed costs so much less than to buy a sofa. And you can have a lot of fun with this crafts project. You’ll need to cut the bed so be prepared for some saw work. You’ll need to get some plywood too. Other than that it’s an easy project. Everything is explained in this tutorial with instructions. So happy reading and have fun crafting! If you prefer watching a video tutorial than reading one, then this project is for you. Watch this video to see how you can build a sectional sofa from pallets. The project is intended for a patio sectional, but you can use the same idea for the indoor couch as well. It’s up to you. The look you get is industrial or rustic depending on the finish you choose. In any case, you can build a beautiful piece of furniture! Most DIY couches don’t have built-in storage. Usually, it’s either by design or to simplify the project. 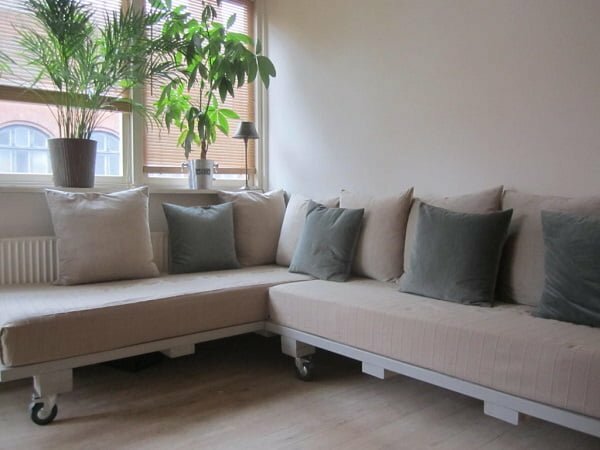 But if you want a fully functional sofa with storage, you can make one too. Here are the plans from Ana White. 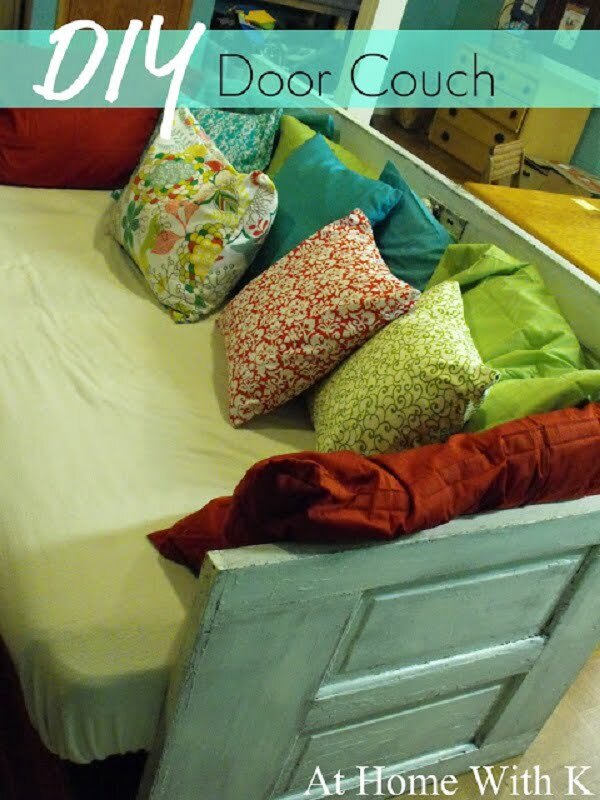 This beautiful DIY couch is based on a sleeping pad foam cushion which means you can use it as a sofa bed as well. So you get seating, storage, and a bed for guests. And you can build all that yourself. It’s so much fun! 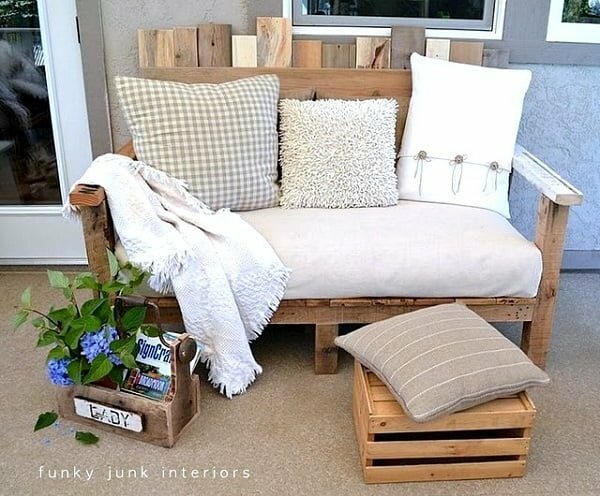 You can make this beautiful outside couch, but it can be used inside as well. We love the designer look of this project! Anything that comes from Handmade Modern is so slick and, well, modern! 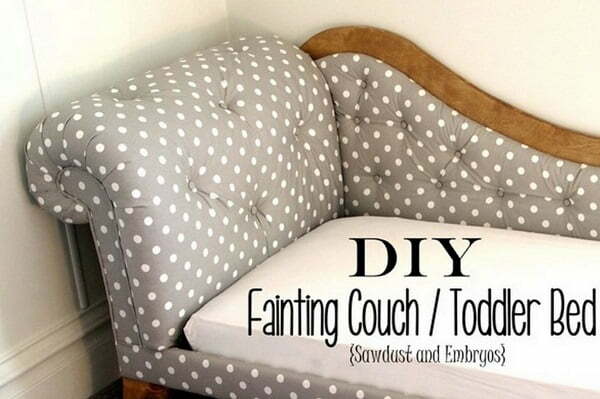 So check out this project with a tutorial on how to make a nice DIY couch. Note that you can choose any finish to fit any decor style. Have fun! We love simple projects. And we are sure you like them too. After all, it’s always a lot of fun to make something over a weekend. 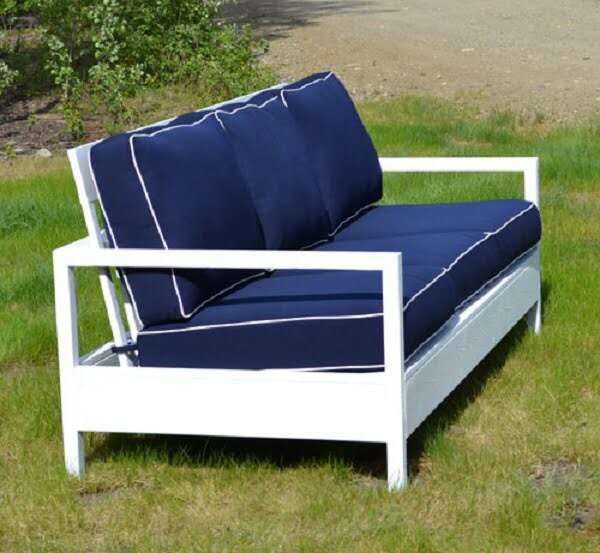 In this case, you can make a beautiful white outdoor sofa! Well, you can make an indoor couch for your home using these plans as well. There’s little difference between the two. So check out the shopping list for this project and get your supplies. It’s going to be a fun weekend! You knew it was coming. We’re suckers for rustic DIY furniture. And we know you love it too. So you’ll enjoy this little project as well! 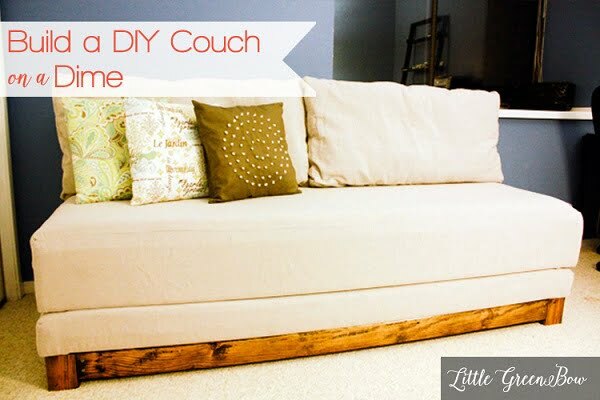 Let’s make a rustic DIY couch! This project is for an outdoor sofa too. But who doesn’t want a little rustic charm in their home? We sure do! 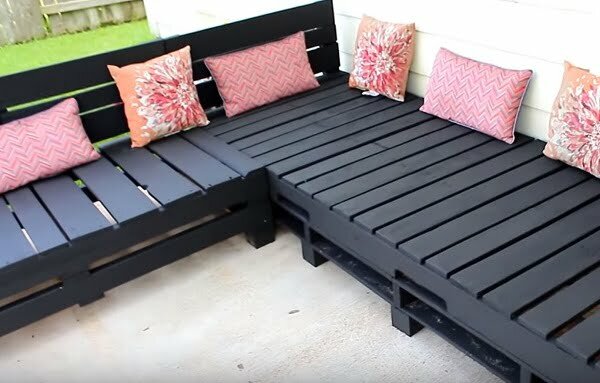 So check out this pallet project! 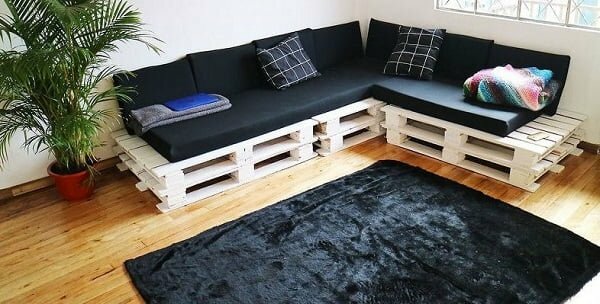 You’ll need pallet wood and some creativity to build this sofa. Everything else is provided in this tutorial. Check it out and have lots of fun! This copper pipe couch is just awesome. It’s a real gem of design. Of course, you have to be a bit of a master welder to build it. But if welding isn’t foreign to you, by all means, you should give this sofa a shot! You’ll need a lot of copper pipe for this project. Once you get your supplies, you can start crafting. Prepare to give this project more time as it can be a bit tricky at times. But it sure is a lot of fun. The couch is simply beautiful in copper accents and fabric of your choice! 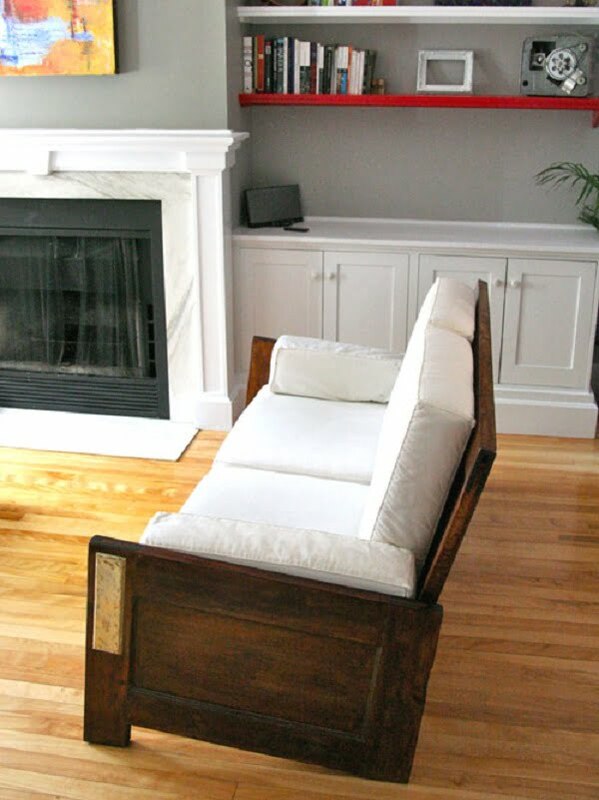 This is the second DIY couch project from old doors on this list. This one is even more detailed. And let us tell you, it’s amazing. Can you do this at home? You’ll need a few old doors, to begin with. So check out a local yard sale or Craigslist for old doors. You can probably pick them up for free. Talk about a cheap project! Can you imagine how much you save by doing this instead of buying a sofa? This project is a lot of fun, and you can do it over a weekend. Have fun! This project was made for a small sofa for an RV. If you have a place for such a small piece of furniture in your home, then you’ll find this project useful. 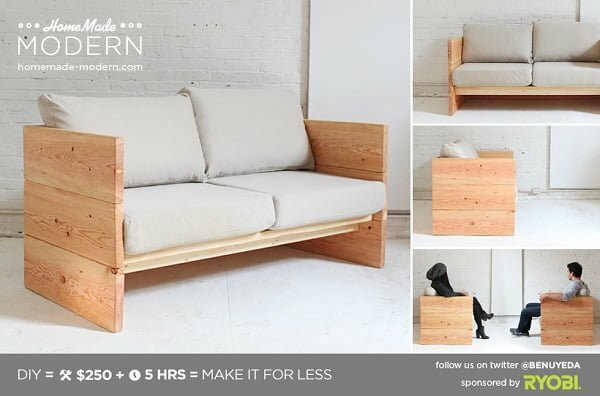 You will build your couch from plywood. It’s a cheap material, but it’s just right for such a small piece of furniture. You will also need upholstering material for cushions (or you can reuse an old couch). Everything else is explained in this tutorial. 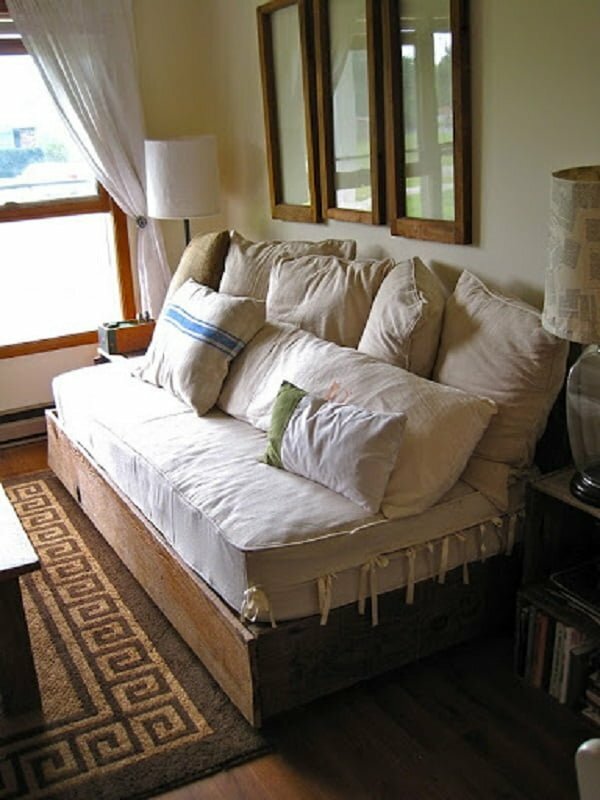 This is just an idea for a rustic wood couch rather than a tutorial. But having such a big list of tutorials, you can quickly come up with your project. Just use this idea for what your couch might look like. We love rustic decor, so this idea is perfect for anything of this style. We’d like to see you making it for your rustic farmhouse home look! Pallet sectionals look great in Scandinavian decor. This idea is a brilliant example of that. While this post is not in English and doesn’t have instructions, we already have projects for pallet sofas on this list. You can combine one of the above tutorials with this look. After all, there’s a lot of fun in doing your DIY project by inspiration. You’ll have lots of fun doing it! 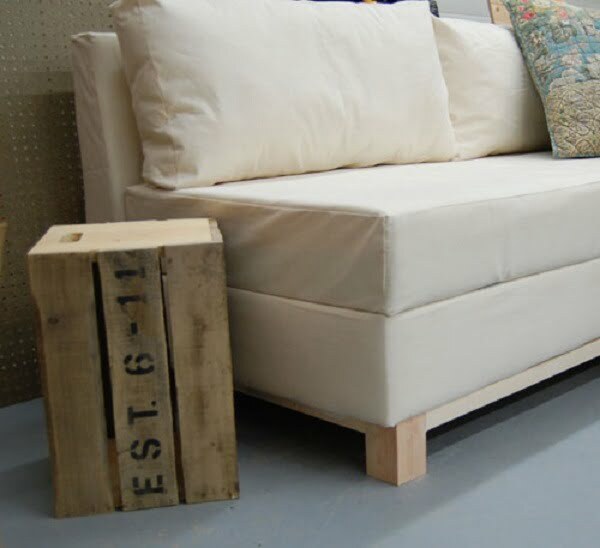 Pallet couches have this striking industrial look that is sure to make a conversation piece. They are some of the easiest pieces of furniture to build. Especially if you have a video tutorial to follow. Check out this tutorial on Home Talk to build your very own DIY couch in just a couple of hours and cheap. It’s straightforward and a lot of fun! We’ve talked about decorating with waste materials before, but this is taking it to the next level. 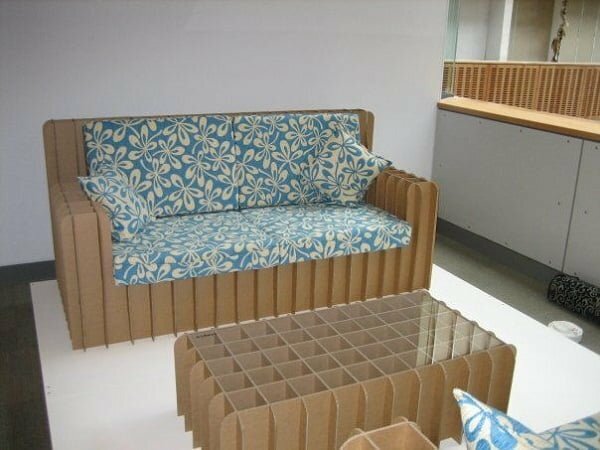 Did you know you can build furniture from cardboard? It makes very light, easy to assemble, easy to transport furniture that is surprisingly sturdy. Want to try this project? 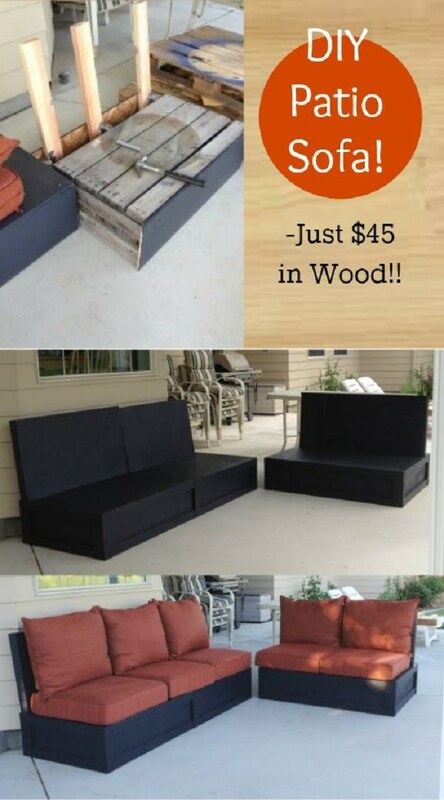 It’s as cheap as it gets and quick way to build a couch. Whether you’ll use it in your living room is a matter of choice, but it sure is a fun little project!